Tobacco and tomato plants are both part of the Solanaceae family, along with eggplants, peppers, potatoes and nightshade. As relatives, they both resemble and face some of the same challenges as each other. Interestingly, it is also possible to cross the two, although this has not been done extensively as of July 2010. Tomatoes are a vining crop that grows flowers and then fruit. Fruits vary in size, color and shape according to cultivar (specific type), and are bred primarily as edible crops for humans. Tobacco plants, like tomatoes, produce suckers and flowers. However, in the case of tobacco plants that are grown for production of tobacco meant for smoking, flower buds should be removed as soon as they form. This process, called “topping,” encourages the tobacco plants to grow larger, thicker leaves than they otherwise would. The leaves can then be harvested, cured and aged for smoking use. 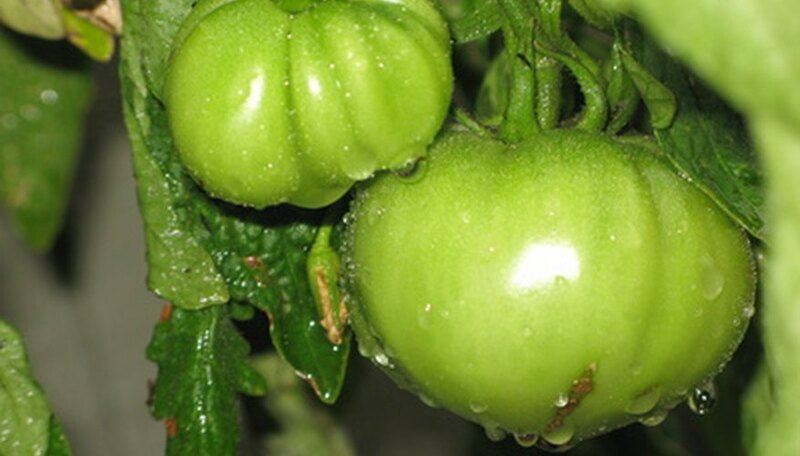 Topping is also sometimes recommended for tomato plants, in which case the result is increased fruit production. However, some difference of opinion exists among tomato gardeners as to whether this practice is effective. Tobacco-tomato mosaic disease, also sometimes seen as tomato-tobacco mosaic disease, is a common disease shared by both plants. It is considered so deadly to tomato plants in particular that gardeners who smoke commercially bought cigarettes or tobacco of any kind are advised to wash their hands thoroughly prior to handling their tomato plants. Any visitors to the garden should also be encouraged to do the same. Symptoms in both plants include a yellowy-brown mosaic pattern that develops on the leaves, giving the disease its name. Growth is stunted; leaves, flowers and fruit are all markedly less productive. Tobacco and tomato hornworms look similar, but are exactly the same. They both affect both plants, however. Both worms are about 4 inches long and very fat. They are light green and have a single big horn on their rear ends. Tobacco hornworms' horns are curved and red, whereas tomato hornworms have a bluish-blackish straight horn. Tobacco hornworms have seven white diagonal stripes down their sides, whereas tomato hornworms have eight V-shaped stripes on each side instead. Both eventually become hummingbird (or sphinx) moths, and it is possible for both to coexist peacefully on the same plant. Tobacco-tomato mosaic virus can best be controlled by planting resistant varieties of either plant and taking care when touching plants. Hornworms are easy to see, and can be removed by hand when noticed on the plants. Conventional pesticides and organic integrated pest management methods may be utilized to control hornworms when the crop is too large to make hand-picking feasible. In a 1999 episode of "The Simpsons," Homer Simpson combines the two plants to grow “tomacco.” While it may have seemed like a fanciful television conceit at the time, it is actually possible to grow such a plant. In 2003, a hobby gardener named Rob Baur from Lake Oswego, Oregon, used grafting to create such a plant. With tobacco rootstock with a tomato plant grafted onto it, the plant showed nicotine levels in its leaves in laboratory testing. It also bore fruit, although the fruit was not made available for testing.